Arthur Darvill isn’t a stranger to TV time travel, but he’s never been at the helm of a vehicle zipping back to 1980s Russia or forward to an apocalyptic future. For three seasons of “Doctor Who,” Darvill starred as Rory Williams, who was the 11th Doctor’s reluctant companion in the British sci-fi hit. Rory and his wife, Amy Pond, sped through space and time with the Doctor aboard his police call box-shaped TARDIS. 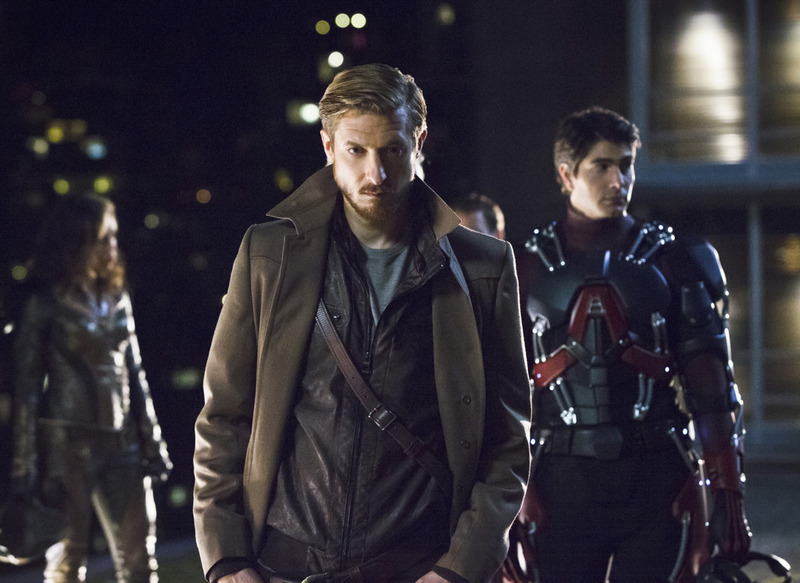 Now the English actor is playing Rip Hunter, a Time Master who pilots a time ship he calls the Waverider in the comic-book inspired “DC’s Legends of Tomorrow,” airing Thursdays on The CW. The similarities of the two time travelers are not lost on Darvill. Darvill, sitting for an interview at the January meeting of the TV Critics Association in Pasadena, Calif., said Rip is not an alien like the Doctor. Unlike the Doctor, he uses a weapon—a ray gun—and isn’t afraid to throw a punch. “I have had to learn to punch people in the face, which I’ve really enjoyed,” Darvill said, laughing. Rip wants to avenge the murders of his wife and son—who in the show’s premiere were killed by the immortal baddie Vandal Savage (Casper Crump) as he conquered the world in 2166. In order to defeat Savage and prevent the murders, Rip travels 150 years into his past—the current present—to assemble a team of eight not-quite-heroes to help him. The super team includes Ray Palmer, aka the Atom (Brandon Routh); Sara Lance, aka the White Canary (Caity Lotz); Professor Martin Stein (Victor Garber) and Jax Jackson (Franz Drameh), who together become Firestorm; Leonard Snart, aka Captain Cold (Wentworth Miller), and his partner in crime Mick Rory, aka Heat Wave (Dominic Purcell); and Kendra Saunders (Ciara Renée) and Carter Hall (Falk Hentschel), aka Hawkgirl and Hawkman. All the actors except Darvill appeared as their characters in The CW’s other comics-inspired shows, “Arrow” and “The Flash.” Greg Berlanti, an executive producer for all three series, said in Pasadena that “Legends” came about because he and his fellow producers wanted to give the actors and writers a chance to dig deeper into these characters’ lives. When the producers decided to add the Rip Hunter character, whose first comic book appearance was in 1959—four years before “Doctor Who” debuted on British TV in 1963—they found a way to bring all the characters together. “We got really excited by the sort of ‘Dirty Dozen’-‘Ocean’s Eleven’ style of mash-up or team-up of these characters on a singular quest,” Berlanti said of the characters, who had never been brought together in the DC Comics books in this way. With nine main characters, the writers can group them in multiple ways for new missions throughout the season. Character dynamics change with each adventure, Darvill said, as does the tone of the show. Darvill is especially excited about “Blood Ties,” airing Feb. 4, which he says has the feel of a classic Hammer Film Productions horror film. In the Feb. 11 episode, “White Knights,” the team travels to Soviet Russia in the 1980s.